Lime bikes at Husky Stadium station. Credit: Bruce Engelhardt. On Monday, the Seattle City Council voted in favor of two major expansions of public bike infrastructure, though one is a nonbinding resolution, and does not carry the force of law. The meaningful vote authorizes the expansion of dockless bike share to a potential 20,000 vehicles, provided SDOT develops a bikeshare parking enforcement regime and improves the pedestrian experience of people with disabilities. The council moved to allow SDOT to expand dockless bike share to at least 20,000 bikes, spread among up to 4 companies. Companies could pay up to $250,000 in fees to the city (one current provider, Ofo recently announced that it would be exiting the Seattle market due to the new fee structure). Some critics of bikeshare have argued, with scant evidence, that poorly parked bikes aren’t just a nuisance or eyesore, but rather that they’re bad for business or other civic virtues. More importantly, several blind and vision-impaired Seattle residents pointed out that unpredictably parked bikes are dangerous for them—and encouraged the construction of the basic bike network to keep bikers off sidewalks. “Blind, disabled, and all other pedestrians are being severely impacted by the bicycles that are littered on the sidewalks that we try to walk on,” says Marci Carpenter, president of the Washington chapter of the National Federation of the Blind. “There needs to be direct parking enforcement and management of the right of way. I support the basic bike network because the more cyclists feel comfortable riding in bike lanes on the streets, the less likely they are to run into us on the sidewalks. In response to the comments and lobbying of Carpenter and other people with disabilities, Councilmembers Lisa Herbold and Mike O’Brien added unanimously approved amendments to the bike share ordinance. Herbold’s amendment will allow bikeshare contractors to add 1,000 additional bikes to their fleet if they make major investments in vehicles that can serve people with disabilities, and O’Brien’s mandates parking enforcement. We’ll report on the bike parking enforcement program when more information becomes available. For last-mile travel between home and a transit hub, bikes are a much more sustainable way to travel than Uber and Lyft. While riding Lyft the other day on a long trip (in a part of the country with nearly zero public transportation), the driver basically confirmed what I have always believed that short trips are unprofitable for the driver because the fares are largely per mile the passenger is in the car, and do not adequately compensate the driver for the empty driving to get to the pick-up point, or for the fragmentation that occurs in the drivers time from taking a bunch of short trips. Instead, the drivers put up with the short trips (e.g. one that that complements public transit) to keep their acceptance rate up in hopes that they can get a long trip (e.g. one that replaces public transit altogether), for which the fare is high enough to give the driver a decent hourly wage and make up for the short trips. (Most profitable of all for the driver are long trips on near-empty highways during off-peak hours, when there are no traffic delays). Of course, when Lyft and Uber become driverless, the economics of such will change, but as long as the cars driven by humans, taking a passenger 1-2 miles between home and a transit hub would probably require a fare on the order of $10-$15 to really be worth the driver’s time. Under Mercer Island’s proposal, this would result in a taxpayer subsidy of $5-10 each way, or $10-20 round trip, which is not much cheaper than simply paying for the driver’s parking in downtown Seattle. Bikes, by contrast, require much less per-trip labor, if any, and involve much cheaper vehicles, so can be profitable with much lower fares. Assuming decent bike facilities, they also offer certain advantages for the passenger experience over Uber/Lyft, such as the use of trails to bypass car congestion on the local streets, and not having to wait to be picked up. A connection to the UW Station along the Burke-Gilman trail is a perfect example of the type of last-mile service that bikeshare does very well, and with proper packing (e.g. use of backpacks instead of suitcases), I have even used the Link/bikeshare combination to travel to or from the airport. 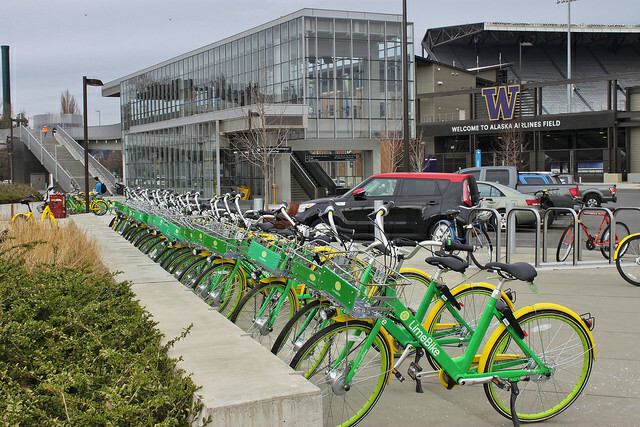 A connection to UW station is also where bikeshare offers an advantage over personal bikes – nobody wants to leave their bike out by a station all day, where it would be a target for thieves – and definitely not overnight for a week on end (for travelers flying out of SeaTac). And, carrying a bike on the train is a nuisance, especially when the train is crowded, or the elevators aren’t working. you could give that driver a tip. I do so regularly for the convenience of the short trip and a quick 3 bucks goes a long way. Im super annoyed with the current bike setup and dumped bikes everywhere. I dont want to see the number of bikes doubled nor do I want more bike lanes. I want the war on cars to stop and the metro welfare to end and the city to actually try to do something useful for taxpayers. They only care for busses, bikes and bums and everyone else can go to h3ll. Our transit plan is a big expensive failure. More bike share bikes. More bike lanes. More transit lanes. More road diets. Ban left turns off arterials where there isn’t room for dedicated turn lane. Heavy SPD enforcement of cars driving in bike lanes, transit lanes, box blocking, failing to yield to pedestrians, or running red lights. … but that was just an excuse, because Ofo was going to withdraw from most of its US cities anyway because it’s losing so much money. So anything less than being the most profitible city in the country or huge tax incentives would have tipped Seattle to the No column to avoid hard decisions. Only Lime will remain, I predict. Spin has a much smaller fleet based on my observations. Ofo is apparently on the way out. With both rivals gone, Lime could raise prices – I can’t imagine it is remotely profitable currently. I agree that only Lime will remain. I also feel that the enormous annual fee will discourage any new competition, which will allow Lime to raise it’s prices, which will drive down ridership, which will cause Lime to become unprofitable and quit Seattle. Alternative scenario: Seattle imposes a reasonable annual fee and the rental bike business flourishes. The lack of profit is not because of a $250,000 fee. That comes out to $685 per day. If a company has 5,000 bikes, that’s $7 per bike per day. The problem is that the bikes aren’t ridden enough. Each bike is getting one or two rides per day. That means either not many people want to ride, or there are too many bikes, or the company’s marketing strategy is failing. I’m a late adopter: I still haven’t ridden a rideshare bike yet. I’m a non-driver who has owned several bikes so I’m obviously not anti-bike. And it’s partly because I’m older now: biking isn’t as easy as it used to be so I have a higher threshold to feel it worth the bother, and I’m wary of installing another smartphone app and making credit-card payments on it and giving them my info if I don’t have to. But these are all standard marketing challenges that every company faces. It’s not failing because of high fees any more than companies are doing poorly and won’t invest because of “high taxes”. That’s just an excuse to get the lowest taxes in the world, because our taxes are already lower than average. It’s possible to reach a state where bikes are used every hour or two. The companies just need to keep trying. based on 5k bikes, 1 ride/bike/day, and $1/ride, the $250k tax is equivalent to a 13.6% tax on their revenue ($1.825M). I think JayH’s scenario sounds much more likely. Another way to think of it is that, with the same calculations, they have $1.83M/year revenue to cover their operating costs in Seattle. take away $250K that’s down to $1.58M. if we say a third of that goes to maintenance (~$100/bike/year, which sounds reasonable for the costs to maintain a personal bike that gets stored inside, not thrown in lakes, etc), the remaining $1.05M would only cover 17 employees making $60k/yr w/o any benefits. Somewhere in all of that they also will have to pay rent on warehouse/office/repair shop space, maintenance/fuel/licensing for vans for rebalancing, and a portion of the national overhead to keep software updated and develop competitive hardware. This is admittedly a rather course estimation of Lime’s books, but it’s hard to conceive that a 13% hit to revenue wouldn’t be enough to make any company start sweating. They’re either going to have to gamble with the market to see if they can get more $/ride, or find some miracle to increase the rides/bike/day without increasing their costs. They could conceivably do this by limiting the area they rebalance to (eg just downtown), but they’re not allowed to do that due to equity concerns. I would really call into question that SDOT needs $600K to oversee this project. It reeks of SDOT making up numbers with wishful thinking, and unwillingness to find room in other parts of the budget that would already be earmarked for things like “data analysis, portal, and repository services” for which no other industry foots their own bill. Also, that the 1.5 FTE overseeing the program would cost the city $246K/FTE seems a bit ridiculous, and why couldn’t these 1.5FTEs be doing some of the work outlined in the other budget line items? So… I really hope that the City Council didn’t just inadvertently doom bike share to failure because they didn’t do a little multiplication, scrutinize SDOT’s requests, or consult with the industry that they’re hoping to regulate. good luck, Lime… I’m rooting for you. well, just after posting I went to my inbox to find that Lime just announced raising $335 mil in VC funding. Admittedly that will likely go towards capital investments and startup costs not included in my earlier math. It will certainly be interesting to see how this plays out. Don’t forget the electric lime bikes. The cost per ride is much higher than $1. A 30 minute ride costs close to $6 I believe. The next likely competitor, Jump, will also charge something similar to ride their electric fleet of bicycles. Seattle does indeed do a horrible job and keeping sidewalks passable clear. It’s not only random bikes, but bushes (especially blackberry branches) and trees are often in the way. Tree roots upend many sidewalks all over town. Other pedestrian-friendly cities are much more aggressive about requiring upkeep. I think Seattle should do more. I’d like to see Seattle aggressively fine property owners for negligent upkeep. If that extends to bike share companies, so be it. Then the bike share companies can pass the fines along as appropriate. Trees > Street Parking > Bikes > Cars > Pedestrians seems to be the hierarchy here as to who gets street and sidewalk space. You can instantly report all sidewalk vegatation overgrowth and damage issues you encounter with the “Find It Fix It” smartphone app. You will get results and/or have tracking numbers and contacts. The city sends a stern warning to the property owner. In North Seattle I have always had outstanding results within a month or so. You submit a photo so it’s hard to contest. A useful standard is that at least half or more the sidewalk is blocked. One site, which was a largish apartment building near Metropolitan Market took a second report but resulted in a big redo of shrubbery. Seattle used ro have staff to look for these problems along with actually trimming stuff etc, but, by about 1990, it’s up to us to be their eyes. Couple other ideas, Al. What if every bike had to carry a (non-removable) license tag, registered with the police- same as with cars. Lost or stolen? Owner calls or e-mails and gets it back. Unclaimed? Give it to someone who can’t afford a bike. In a lot of countries, bikes are cars. In this country more and more people are using them for deliveries. Not like they’re junk. But good turn-in incentive? Like plastic bags full of cans. So remember when Seattle put a cap on the maximum number of private cars that could be used on city streets? Something that is worth noting on this blog is that according to SDOT “75% used bike share to access transit” at some point. Bike is my preferred short distance transport. I have a Lime subscription. Anyway, I want to level set for the readers of STB regarding a yearly $250K fee, to be paid by a company. That is the fully loaded cost of one (1) senior software developer – cash, bonus, benefits, stock, office space, desk, computer, etc. A cheap one, too. Top senior & staff devs can run half a million per year; the genuine superstar devs can clock beyond that. So – it is not a substantial fee for a VC backed firm. Lime just announced a 335 Million VC investment. That is an enormous amount of money – Seattle’s fee is negligible. ofo had previously downshifted US investment – they are slipping a knife into Seattle politics on the way out – that’s all that it is. Right, but if Lime was going to use that money to hire software development staff for every city it operated in the venture capitalists would laugh at their pitch. You take investment loans to fund product development, not operations. Compared to the yearly revenue they’ll get from 5k bikes in Seattle it is a significant fee. The question is how much that cost means to them operationally and what the revenue (or its lack) would mean for the city budget. This is a very weird way to think about VC. It’s true, I suppose, that a company flush with VC can afford to pay fees they wouldn’t otherwise with it, but the purpose of VC is ostensibly to get the company to profitability, not subsidize my cheap bike rides or the City of Seattle’s bottom line. If the fees are too high to make it a profitable operation, at some point the VC will dry up and so will the company. With so many bikes I think we need a big city/vendor partnership to install bike racks everywhere. Not just painted lines on the ground, but actual racks to take personal and rental bikes in an orderly fashion. Then offer people a small penalty ($1) if they leave a bike outside a rack, and a small bonus ($.50) if they retrieve a bike that’s been left outside of a rack. Try to have some semblance of order to keep these things from being bright green litter abandoned everywhere. I’m tired of rhetoric describing bike share bikes as “litter” “everywhere.” When I move about the city, all I see are cars ditched, literally everywhere. All sorts of cars, ugly, pretty, clean, dirty, parallel parked, back-in angle parked, parallel parked on the wrong side of the street. In people’s driveways, blocking sidewalks, jammed into alleys, parked on planting strips. Everywhere. Cars are ugly, and they are littered all over the city. At least Lime bikes are monochromatic, and all in fairly good repair. Im more tired of all the tents and garbage not to mention piles of stolen bikes and parts. City priorities need to be zero tolerance to that crap. Taxpayers need to start getting some priority attention too. We are subsidizing a garbage dump. Notice all the campers that have moved in everywhere? A) Way to stay on topic. B) The populist devil-angel on my left shoulder wants to applaud your comment and say YES! Zero tolerance! Jail them all! Take back our city! But it costs $85/day to keep someone in jail (estimated. google it). If we one by one start throwing urban campers in jail, we’d be spending more than if we simply just rented them each a 1-bedroom apartment! So, what’s your zero-tolerance, zero-cost approach to taking back ‘your’ city? Homelessness has increased at the same rate as housing prices. I wonder why? And most of them are long-time locals. 6) bikes come perhaps after all the previous items. I’d love SDOT to make an analysis of the actual walkable width. Bikes are just one factor, and relatively small factor here in my opinion. Tacoma needs to get on the bikeshare program. Talked to some Lime reps about that this spring. Lime only goes into a city if it meets a minimum bar of bike infrastructure and support for bikes. Tacoma does not, according to Lime. I live there – rather bike in Seattle’s downtown *any* day over the carmad death machine drivers there. Well, that’s unfortunate but understandable. I didn’t realize Mercer Island and Bellevue would meet those standards but Tacoma doesn’t. Did you happen to also ask when Seattle will get the scooters like they have down in Portland? Mercer Island is close enough to Seattle to get some kind of network effect, and e-bike pricing is high enough to make any trip over the I-90 bridge quite profitable for the company. It is also close enough to Seattle for the same ground crew to service boty areas without excessive driving around. Neither is the case for Tacoma. Another factor in Lime adding suburban cities around Seattle is in many cases a large number of bikes from Seattle were making their way there already. This was true in the case of Bellevue and I wouldn’t be shocked if the same was true for Mercer Island. See Rachael’s excellent story for more. There’s no evidence bike share will “die” because of this and the great thing about a tax is that it can always be removed/reduced if the desired outcome doesn’t work out. So what’s the fundamental reason we should be taxing bikeshare? I’m a fan of taxing what we want less of and subsidizing what we want more of. It’s a pretty fundamental concept. They’re taxed like any other Seattle business currently. If there’s some sort of extra impact compared to parking companies or smoke shops that needs to be dealt with we should consider if it’s a better idea for that impact to come out of the general fund rather than adding a special additional tax to something most people would thing is a benefit to our city. The fee is ostensibly to compensate for the cost of regulating them. Somebody has to monitor them and go after them if; e.g., their patrons park the bikes illegally or ride without a helmet. If $250K is not a reasonable amount for that, what is? What are you basing it on?